BEIJING -- Toyota Motor Corp., the dominant maker of gasoline-electric autos, will push forward with its strategy to build and sell hybrid models in China, in spite of the government’s unwillingness to subsidize the technology. The Japanese automaker wants to bring a hybrid version of its RAV4 SUV to market in China as soon as possible, said Matsumoto Shinichi, executive vice president of Toyota’s local engineering and manufacturing unit. The company plans to localize the development and production of hybrid SUVs in the world’s largest auto market, after introducing Corolla and Levin hybrid compact cars late last year. In offering subsidies that have reached 114,000 yuan ($17,500) per vehicle for highly electrified vehicles and exempting them from license-plate restrictions in major cities, China has snubbed technology that Toyota and its Japanese peers have made mainstream in their domestic market. China’s government is keen both to protect its local manufacturers and incentivize them to beat overseas competitors to achieving mass-market success with electric vehicles. So far, the Corolla and Levin hybrids are holding their own without subsidies. Toyota has received orders for about 40,000 units. Its plants have been unable to keep up with that level of demand, building about 30,000 units since last year. Plug-in hybrid versions of the two models will begin selling in China from 2018. In spite of the government turning a cold shoulder to the conventional hybrids embraced by their home market, Toyota, Nissan Motor Co. and Honda Motor Co. each sold more than 1 million vehicles in China last year for the first time. Three years earlier, Japan’s three largest automakers weathered annual sales declines as a territorial dispute with China prompted a consumer backlash. The clash helped open up the gulf between Japan’s automakers and General Motors Co. and Volkswagen Group, which each sold more than 3.5 million vehicles in China last year. Toyota is now gaining momentum after delivering a record 1.1 million vehicles in 2015. Sales jumped 28 percent to about 291,000 units during the first three months of this year. The automaker plans to boost local production capacity by about 5.6 percent to 1.13 million units in the near term, adding assembly of one new model each at two plants run by joint ventures with China FAW Group and Guangzhou Automobile Group Co. by mid-2018. Toyota will begin producing the C-HR compact SUV locally that year, Hiroji Onishi, the company’s China chief, told reporters Sunday. Toyota’s hybrid sales may be even higher if China had included the technology for incentives and exemptions from license-plate and traffic restrictions. David Yang, 34, would have bought the Toyota Levin hybrid if it qualified for a license plate in Beijing’s lottery. Under the current system, electric cars are in a separate category that has a much higher chance of winning an ownership permit. Bringing the C-HR and a hybrid version of RAV4 to China may help address a weakness within Toyota’s local lineup. It trails many of its competitors in the SUV segment, which drove industry sales growth last year and has continued expanding into 2016. 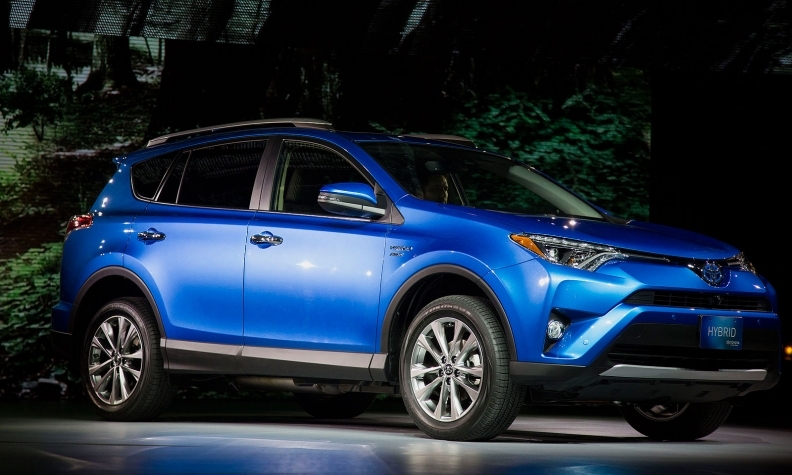 Toyota has annual local production capacity for only about 100,000 RAV4s, its top-selling SUV model in China. By contrast, Great Wall Motor Co., the leader in SUV sales in China, delivered more than 370,000 Haval H6s last year, while Volkswagen’s Tiguan sales exceeded 250,000 vehicles.